1. How to install Office 2016 on my computer ? 2. Why can't I find the Outlook, Calendar, People and Tasks apps in my Office 365 portal? The Outlook, Calendar, People and Tasks apps are not available until we have moved your current mailbox to Office 365. They will show up automatically when your mailbox is moved to Office 365. You can consult the project timeline to know when our mailbox migration is planned. You can also contact us if you want to be part of our early adopters groups. 3. I don't see any apps after first log in to my Office 365 portal. Why and how can I fix that? 4. My email stopped syncing on my mobile device after being migrated to Office 365, what should I do? If you're using your mobile's built in email application to sync with your AUP email, then you need to remove the profile and set it up again. This is to synchronize with the new configurations. If you are using the Office 365 Outlook app, you don't need to do anything because the application will automatically update the sync setting. 5. How to setup my email and Office 365 app on my mobile devices? 6. How to remove an email profile from your mobile devices? 7. How to log in to my AUP Office 365 email? A shared mailbox doesn't require a password and you need to have access to it granted by ITS. 3- Select: "open another mailbox"
3- If you don't see a folder having your name on the left pane, then under folders, click "more" to expand the folder list. 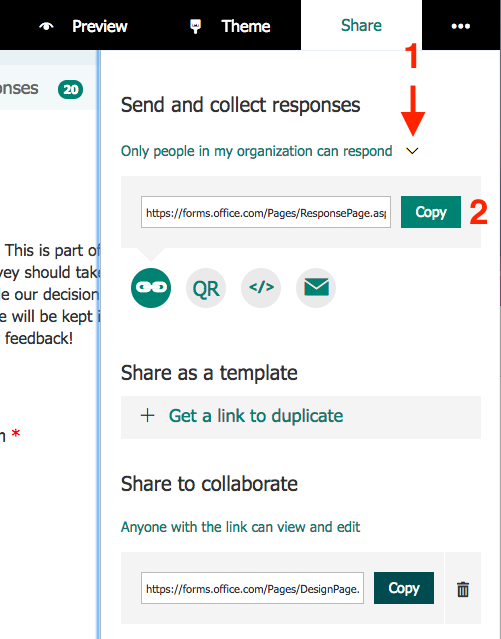 4- right click on your name, then choose "add shared folder ..."
5- Type the shared mailbox address and click "Add"
To format your signature, select the text, and then click Home from the top Ribbon. Apply your desired formatting. Rest the pointer on a column border until the resize icon appears, then drag the columns until the table is the size that you want. Select the Table, then select the Table Design tab. In the E-mail account list, choose an email account to associate with the signature. You can have different signatures for each email account. In the New messages list, choose the signature that you want to be added automatically to all new email messages. If you don't want to auto sign your new email messages, accept the default option of (none). 3. How to Install Office 2016 on my computer ? 1. What is the size of my mailbox in Office 365? 2. How do I remove my exchange account from my iPhone, or iPad? Go to Settings > Mail, Contacts, Calendars. The Accounts screen will open. On the Accounts screen, tap the Exchange Account you want to remove. Scroll down and click Delete Account. A Delete Account warning window will open. On the Delete Account warning window, click Delete Account to finish. You have successfully deleted your Exchange account. 6. How to setup my AUP email on my windows phone ? 7. How can I add a shared mailbox as additional account in my Outlook? 8. Reply Setting: How can I set the default button to be "reply" instead of "reply all"
In Office 365 Outlook online, press on the setting wheel at the top right and type in "Automatic Processing mail"
Click on "Automatic Processing Mail" and in the left panel, choose "Reply Setting"
Select "reply" instead of "reply all"
Go to Settings > Mail, Contacts and Calendars > Add Account. From the choices available, go to the bottom and choose “Other” to manually set up the shared mailbox account. Select “Next” to get to the full settings. Make sure that at the top of the new screen the type of account highlighted is IMAP. Now you will find the shared account in your Mail app, under Mailboxes, with the description name you gave it. Go to Settings and then add an account under the Accounts settings. From the list of types, select your device’s mail application. This is called “Mail” or “Email.” Do NOT choose Exchange ActiveSync. Select “Next.” It will take a few moments for the server to connect and the sync to start. You will be prompted to select a name for the mailbox and to enter the name that will appear in the From field when you send mail. The shared mailbox should appear as an additional account in your mail app. 12. How do I configure my reply settings? 13. How do I change the settings for Clutter? There is junk mail - which is usually spam. And then there is Clutter - which are emails Microsoft noticed you don't really care about. Emails that end up in the Clutter folder are low-priority emails that Microsoft Outlook noticed you don't open very often. Because things go into Clutter based on your behavior (and how important it is flagged), you can "train" Outlook to not put things in the Clutter folder. Do you just want Clutter turned off? See the directions below on how to handle your Clutter. You may not want to get rid of the Clutter feature all together. Thankfully, there is a way to "train" Clutter to put the emails (that you care about) back into your inbox. Note: Moving items back into your inbox tells Clutter: Hey, from now on, I would like to start seeing these in my inbox. 14. How do I activate Bcc? Using blind carbon copy (BCC) allows you to send emails without the other email recipients being visible to one another. This comes in handy when you need to send a mass email, but only want the replies to be visible to you (even if someone accidentally uses Reply All). Another way to think about it; if you receive an email, which utilized Bcc, the email will not show you the other individuals who also received the same email. So how do you activate Bcc? Would you rather the Bcc field to just be there? 1. Can I password protect sections of OneNote? Individual pages? Sections, yes. Pages no. To password protect a section just right-click the section on the navigation pane or on the tab at the top and select "Password protect this section" from the context menu. Pick a good pass phrase to encrypt your section with. 2. How can I learn more about using Staff Notebooks? This interactive guide walks you through how to use the OneNote Staff Notebook. Also, Click here to read more about OneNote Staff Notebook. 1. Can I download a Sway? You can't download a Sway. Sway requires an Internet connection and needs to remain online to manage the layout of your content. 1. How do I begin using Lynda.com? 2. Need to know more about Office 365 Video?